The RVCA produces individual reports for ten catchments in the Middle Rideau subwatershed. 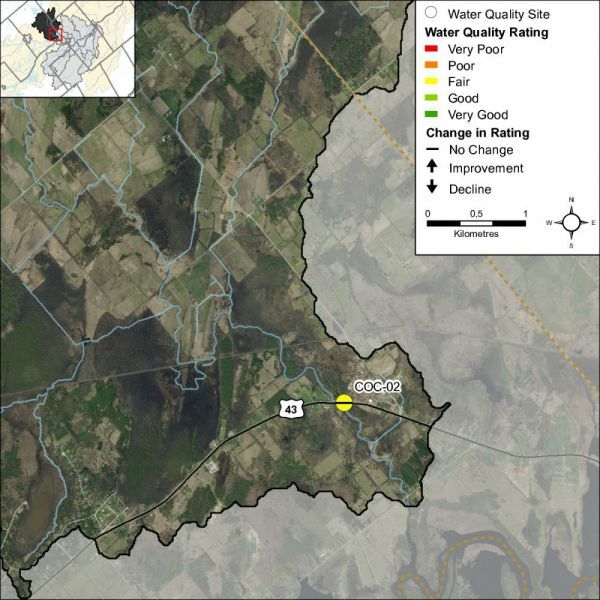 Using data collected and analysed by the RVCA through its watershed monitoring and land cover classification programs, surface water quality conditions are reported for Black Creek along with a summary of environmental conditions for the surrounding countryside every six years. This information is used to better understand the effects of human activity on our water resources, allows us to better track environmental change over time and helps focus watershed management actions where they are needed the most to help sustain the ecosystem services (cultural, aesthetic and recreational values; provisioning of food, fuel and clean water; regulation of erosion/natural hazard protection and water purification; supporting nutrient/water cycling and habitat provision) provided by the catchment’s lands and forests and waters (Millennium Ecosystem Assessment 2005). The following pages of this report are a compilation of that work and contain information on surface water quality, riparian conditions, land cover, stewardship activity and hazard land and water resources protection. Parks Canada staff manage water levels for recreational purposes along the Rideau Canal/Waterway that flows by the catchment, ensuring 1.5 metres of draft during the navigation season. In this managed system, water levels on the Rideau Canal are manipulated by operation of numerous dams. In the Middle Rideau subwatershed, Parks Canada staff operate 9 dam and lock complexes with 13 locks for a fall of 36.2 metres over 35.6 kilometres. Water levels are maintained as close as possible to set objectives through the May to October navigation season. The levels are lowered through the rest of October and into November and held at the winter levels until the spring freshet in late March or early April naturally increases inflows to the system. To reduce the impact of the higher flows in the spring, the amount of snow water equivalent, forecast rain, ice cover, flows and levels are assessed and the dams in the Middle Rideau reach are operated accordingly to quickly pass as much water as possible. In late April and early May, the dams are gradually closed and water levels are brought up to be ready, once again, for the navigation season. Surface water quality conditions in the Black Creek catchment are monitored by the Rideau Valley Conservation Authority’s (RVCA) Baseline Water Quality Monitoring Program. The Baseline Water Quality Program focuses on streams; data is collected for 22 parameters including nutrients (total phosphorus, total Kjeldahl nitrogen and ammonia), E. coli, metals (like aluminum and copper) and additional chemical/physical parameters (such as alkalinity, chlorides, pH and total suspended solids). Figure 1 shows the location of the monitoring site in the catchment. The water quality rating for the Black Creek (COC-02) is “Fair” (Table 1) as determined by the Canadian Council of Ministers of the Environment (CCME) Water Quality Index and is largely influenced by high nutrient concentrations, metals and high bacterial counts. A "Fair" rating indicates that water quality is usually protected but is occasionally threatened or impaired; conditions sometimes depart from natural or desirable levels. Each parameter is evaluated against established guidelines to determine water quality conditions. Those parameters that frequently exceed guidelines are presented below. Analysis of the data has been broken into two periods; 2003 to 2008 and 2009 to 2014 to examine if conditions have changed between these periods. Table 1 shows the overall rating for the monitored surface water quality sites within the Black Creek catchment and Table 2 outlines the Water Quality Index (WQI) scores and their corresponding ratings. 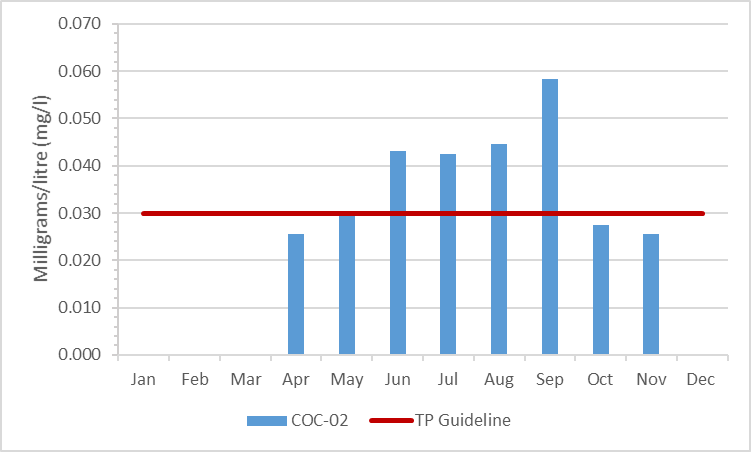 Total phosphorus (TP) is used as a primary indicator of excessive nutrient loading and may contribute to abundant aquatic vegetation growth and depleted dissolved oxygen levels. The Provincial Water Quality Objective (PWQO) is used as the TP Guideline and states that in streams concentrations greater than 0.030 mg/l indicate an excessive amount of TP. Total Kjeldahl nitrogen (TKN) and ammonia (NH3) are used as secondary indicators of nutrient loadings. RVCA uses a guideline of 0.500 mg/l to assess TKN and the PWQO of 0.020 mg/l to assess NH3 concentrations in Barbers Creek. Tables 3, 4 and 5 summarize average nutrient concentrations at monitored sites within the Black Creek catchment and show the proportion of results that meet the guidelines. 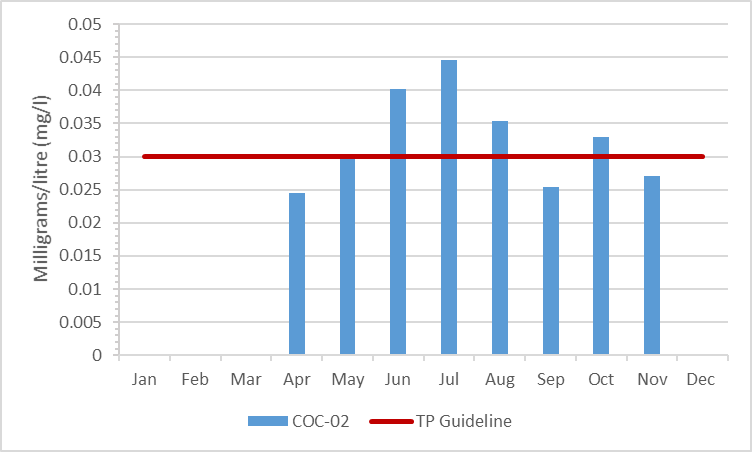 The majority of samples at site COC-02 were above the TP guideline for both time periods (Figures 2 and 3), 38 percent of samples were below the guideline in the 2003–2008 period, this declined to 35 percent of samples in the 2009–2014 period. Average TP concentration decreased from 0.037 mg/l (2003–2008) to 0.033 mg/l (2009–2014). 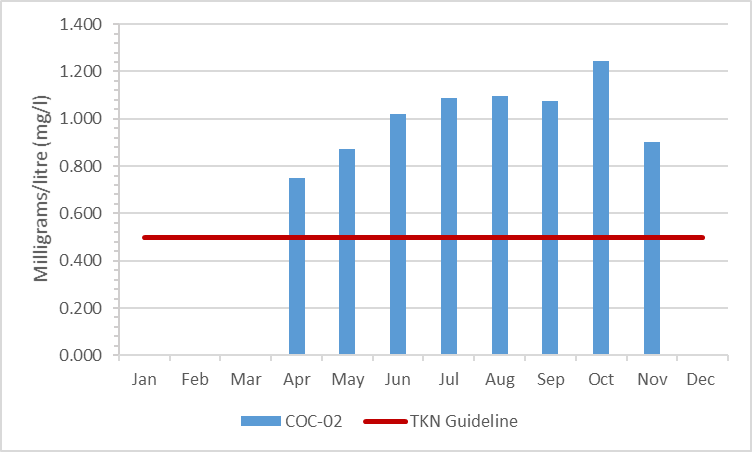 All of the TKN results exceeded the guideline for both monitoring periods (2003-2008 and 2009-2014). 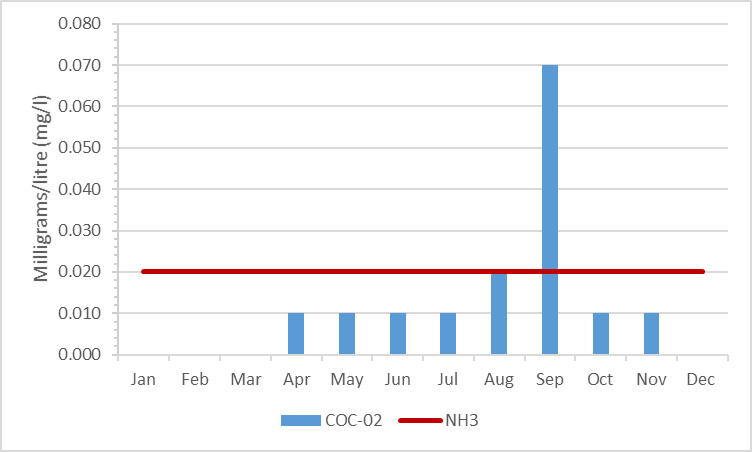 The average concentration from 2003-2008 in Black Creek was 1.244 mg/l (Figure 4), this decreased to .994 mg/l (Figure 5) from 2009-2014. 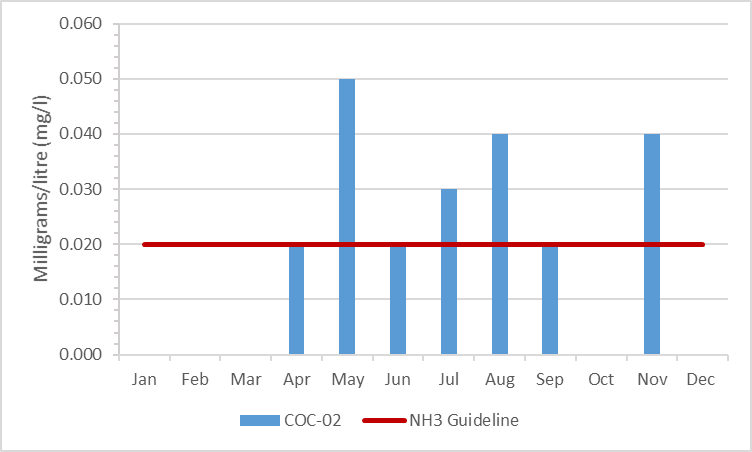 In the 2003-2008 reporting period a majority of NH3 results were below the guideline with an average concentration of 0.017 mg/l (Figure 6). The percentage of results below the guideline decreased from 67 percent in 2003-2008 to 10 percent. The average concentration in 2009-2014 increased to 0.032 mg/l (Figure 7). The data shows that nutrient enrichment continues to be a feature of Black Creek. Water quality guidelines for TP, TKN and NH3 are often exceeded at the monitored site on Black Creek. 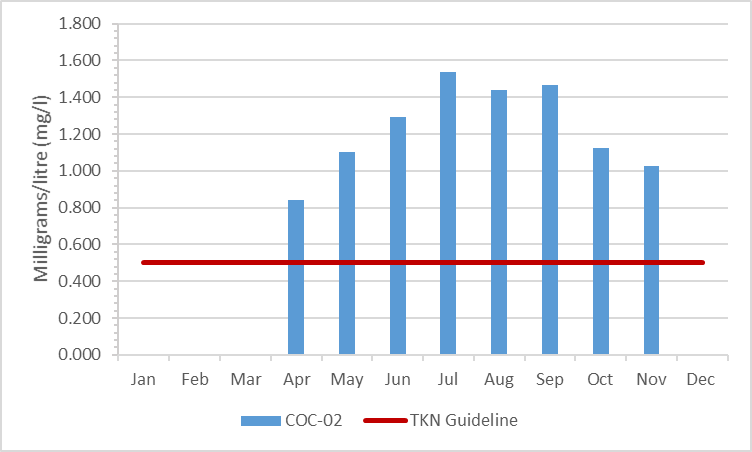 The frequent elevated TKN concentrations may be influenced by organic matter held by wetland areas found upstream in the Middle Rideau Subwatershed, resulting in naturally high concentrations of organic nitrogen. High nutrient concentrations can help stimulate the growth of algae blooms and other aquatic vegetation in a waterbody and deplete oxygen levels as the vegetation dies off. E. coli is used as an indicator of bacterial pollution from human or animal waste; in elevated concentrations it can pose a risk to human health. The PWQO of 100 colony forming units/100 millilitres (CFU/100 ml) is used. E. coli counts greater than this guideline indicate that bacterial contamination may be a problem within a waterbody. Table 6 summarizes the geometric mean for the monitored site on Black Creek and shows the proportion of samples that meet the E. coli guideline of 100 CFU/100 ml. The results of the geometric mean with respect to the guideline for the two periods, 2003-2008 and 2009- 2014, are shown in Figures 8 and 9 respectively. Table 6 Summary of E. coli results for Black Creek, 2003-2008 and 2009-2014. Highlighted values indicated average concentrations have exceeded the guideline. 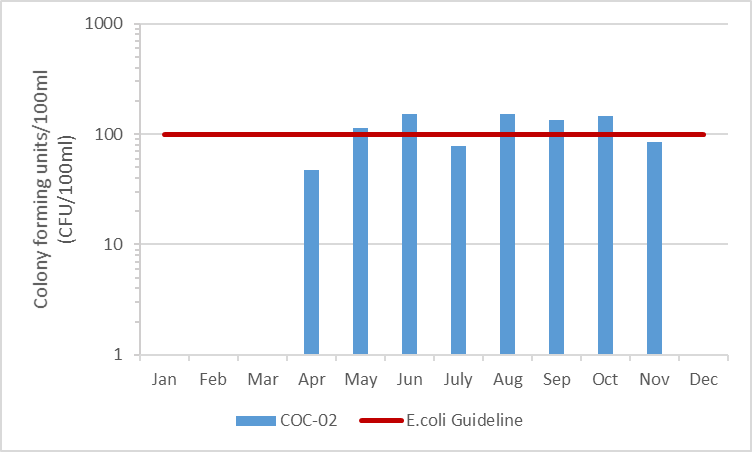 E. coli results at site COC-02 indicate bacterial counts are frequently above the E. coli guideline. The proportion of samples below the guideline decreased from 63 percent (Figure 8) to 47 percent (Figure 9). E.coli counts increased between the two monitoring periods (2003-2008 and 2009-2014) with a geometric mean of 66 CFU/100ml to 104 CFU/100ml (Table 6). Bacterial contamination continues to be a concern at site COC-02 in Black Creek. 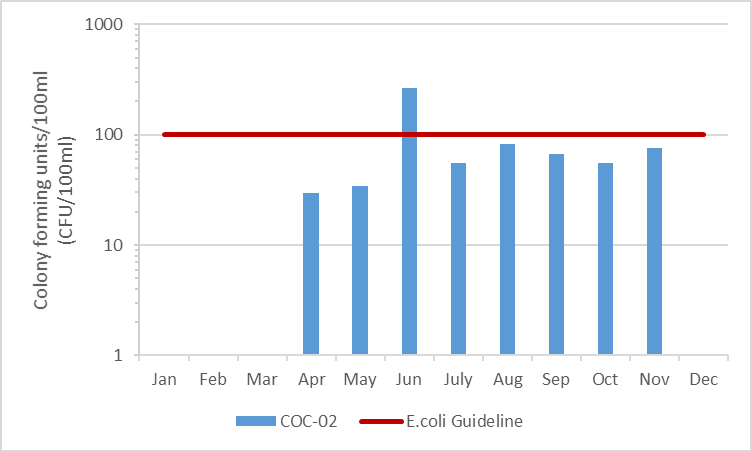 E.coli counts have increased between the two monitoring periods (2003-2008 and 2009-2014), with the geometric mean being above the PWQO for the 2009-20014 reporting period. Properly maintaining septic systems, enhancing shoreline buffers and restricting cattle access can help to improve E.coli levels in Black Creek. Of the metals routinely monitored in Black Creek, aluminum (Al), copper (Cu) and iron (Fe) occasionally reported concentrations above their respective PWQOs. In elevated concentrations, these metals can have toxic effects on sensitive aquatic species. Tables 7, 8 and 9 summarize metal concentrations at the monitored site and show the proportion of samples that meet guidelines. 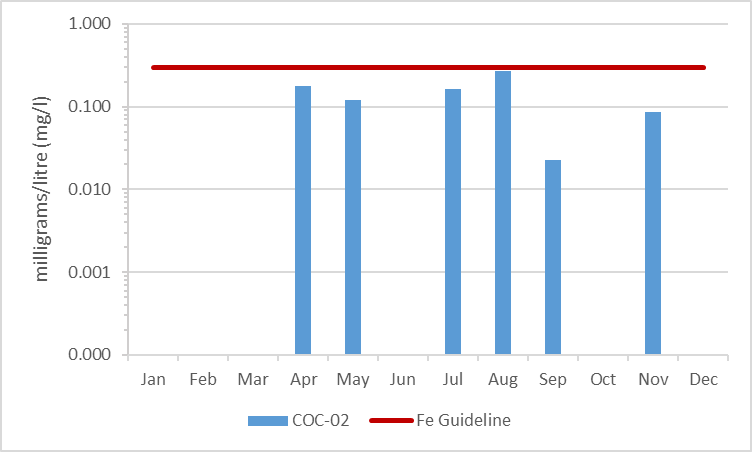 Figures 10 to 15 show metal concentrations with respect to the guidelines for the two periods of interest, 2003–2008 and 2009–2014. For Al the PWQO is 0.075 mg/l, Cu it is 0.005 mg/l and for Fe it is 0.300 mg/l. Table 7 Summary of Aluminum concentrations in Black Creek, 2003-2008 and 2009-2014. 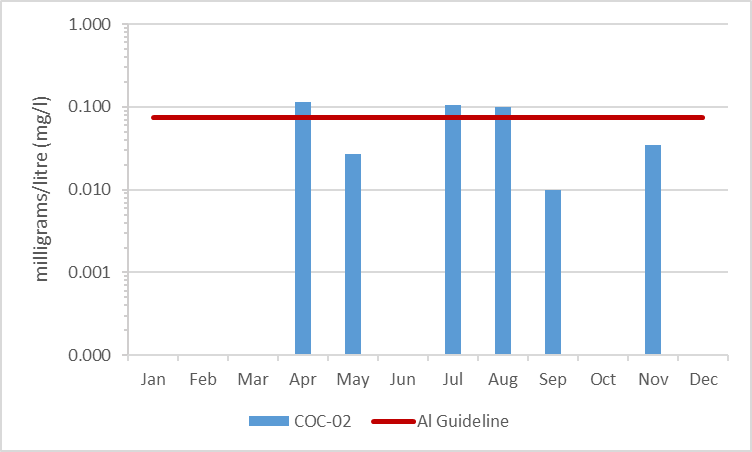 Highlighted values indicate average concentrations that exceed the guideline. Table 9 Summary of Iron Concentrations in Black Creek, 2003-2008 and 2009-2014. Highlighted values indicate average concentrations that exceed the guideline. 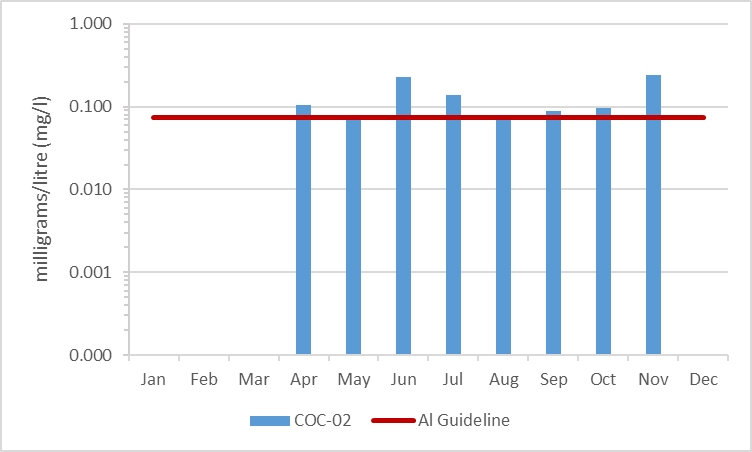 Results from COC-02 shows that Al concentrations had some exceedances with 22 percent of samples below the guideline in the 2003-2008 period (Figure 10). This improved to 69 percent of samples in the 2009-2014 period (Figure 11). The average concentration of Al was 0.128 mg/l from 2003-2008 which exceeds the guideline. From 2009-2014 the average concentration improved to 0.060 mg/l which is below the guideline. 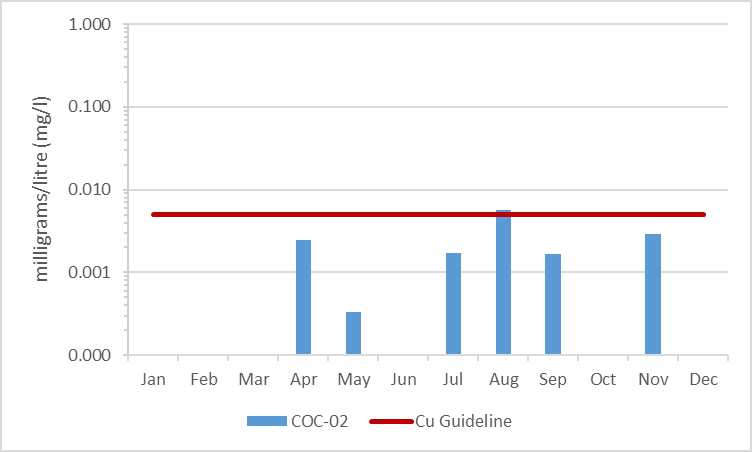 Copper concentrations occasionally exceeded the PWQO, with 89% of samples below the guideline in 2003-2008 (Figure 12). This decreased to 79% of samples being below the guideline in 2009-2014 (Figure 13). 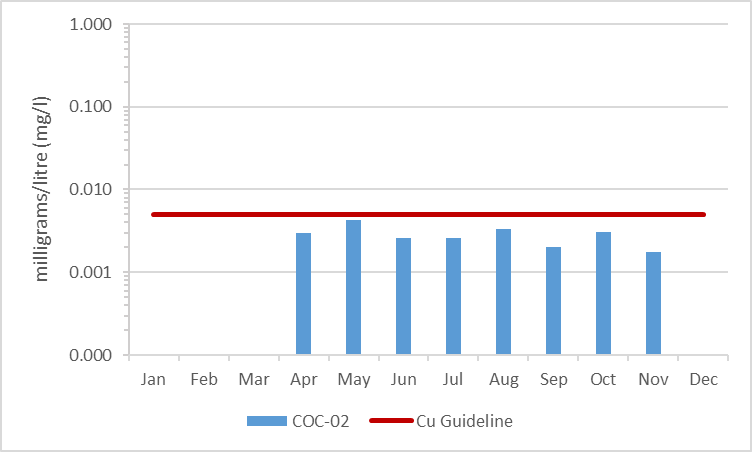 The average concentration of Cu marginally decreased during the two reporting periods from 0.003 mg/l to 0.002 mg/l (Table 8). 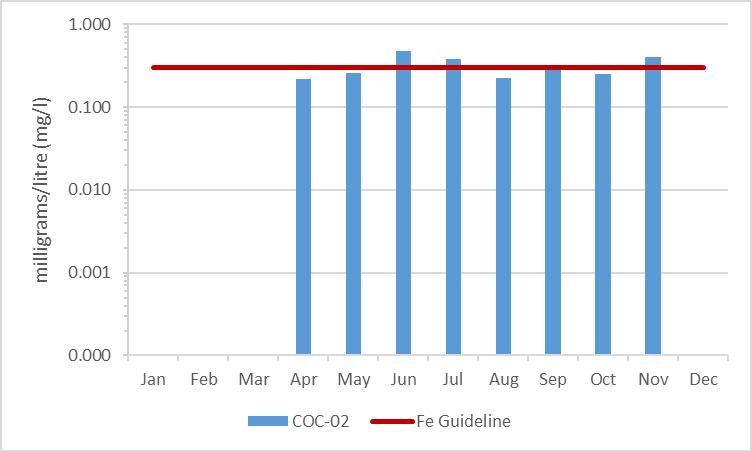 Iron concentrations also surpassed the PWQO guideline. The proportion of samples below the guideline increased from 52 percent to 79 percent (Figures 14 and 15). The average concentration of Fe in 2003-2008 reporting period was 0.309 mg/l which is above the guideline. Between 2009-2014 Fe concentrations decreased below the guideline to an average of 0.130mg/L (Table 9). Overall, a general decline in metal concentrations was observed between the two periods of interest, with the exception of copper which slightly increased. Efforts should continue to be made to identify pollution sources and implement best management practices to reduce any inputs such as runoff, metal alloys, fungicides and pesticides to improve overall stream health and lessen downstream impacts. A type of mean or average, which indicates the central tendency or typical value of a set of numbers by using the product of their values (as opposed to the arithmetic mean which uses their sum). It is often used to summarize a variable that varies over several orders of magnitude, such as E. coli counts. The riparian or shoreline zone is that special area where the land meets the water. Well-vegetated shorelines are critically important in protecting water quality and creating healthy aquatic habitats, lakes and rivers. Natural shorelines intercept sediments and contaminants that could impact water quality conditions and harm fish habitat in streams. Well established buffers protect the banks against erosion, improve habitat for fish by shading and cooling the water and provide protection for birds and other wildlife that feed and rear young near water. A recommended target (from Environment Canada’s Guideline: How Much Habitat is Enough?) is to maintain a minimum 30 metre wide vegetated buffer along at least 75 percent of the length of both sides of rivers, creeks and streams. Figure 16 shows the extent of the naturally vegetated riparian zone along a 30 metre wide strip of shoreline of Black Creek and its tributaries. This information is derived from a dataset developed by the RVCA’s Land Cover Classification Program through heads-up digitization of 20cm DRAPE ortho-imagery at a 1:4000 scale, which details the catchment landscape using 10 land cover classes. This analysis shows that the riparian buffer in the Black Creek catchment is comprised of wetland (55 percent), crop and pastureland (28 percent), woodland (12 percent), roads (three percent) and settlement areas (two percent). Additional statistics for the Black Creek catchment are presented in Table 10 and show that there has been very little change in shoreline cover from 2008 to 2014. Figure 17 demonstrates the buffer conditions of the left and right banks separately. Black Creek had a buffer of greater than 30 meters along 100 percent of the right bank and 97 percent of the left bank. The RVCA’s Stream Characterization Program identifies eight different land uses beside Black Creek (Figure 18). Surrounding land use is considered from the beginning to end of the survey section (100m) and up to 100m on each side of the creek. Land use outside of this area is not considered for the surveys but is nonetheless part of the subwatershed and will influence the creek. Natural areas made up 92 percent of the stream, characterized by wetlands, forest, scrubland and meadow. The remaining land use consisted of active agriculture and infrastructure in the form of road crossings. Erosion is a normal, important stream process and may not affect actual bank stability; however, excessive erosion and deposition of sediment within a stream can have a detrimental effect on important fish and wildlife habitat. Poor bank stability can greatly contribute to the amount of sediment carried in a waterbody as well as loss of bank vegetation due to bank failure, resulting in trees falling into the stream and the potential to impact instream migration. Figure 19 shows low to moderate levels of erosion observed along Black Creek. Undercut banks are a normal and natural part of stream function and can provide excellent refuge areas for fish. Figure 20 shows that Black Creek had low to moderate levels of undercut banks. Grasses, shrubs and trees all contribute towards shading a stream. Shade is important in moderating stream temperature, contributing to food supply and helping with nutrient reduction within a stream. Figure 21 shows variable stream shading conditions ranging from low levels to high levels along Black Creek. Figure 22 shows that the majority of Black Creek had low to moderate levels of instream woody debris in the form of branches and trees. Instream woody debris is important for fish and benthic invertebrate habitat, by providing refuge and feeding areas. Figure 23 shows low to high levels of overhanging branches and trees along Black Creek. Overhanging branches and trees provide a food source, nutrients and shade which helps to moderate instream water temperatures. Figure 24 shows 90 percent of Black Creek remains “unaltered” with no anthropogenic alterations. Ten percent of Black Creek was classified as natural with minor anthropogenic changes in the form of road crossings. Freshwater benthic invertebrates are animals without backbones that live on the stream bottom and include crustaceans such as crayfish, molluscs and immature forms of aquatic insects. Benthos represent an extremely diverse group of aquatic animals and exhibit wide ranges of responses to stressors such as organic pollutants, sediments and toxicants, which allows scientists to use them as bioindicators. As part of the Ontario Benthic Biomonitoring Network (OBBN), the RVCA has been collecting benthic invertebrates at the Poonamalie Road site on Black Creek since 2003. Monitoring data is analyzed for each sample site and the results are presented using the Family Biotic Index, Family Richness and percent Ephemeroptera, Plecoptera and Trichoptera. The Hilsenhoff Family Biotic Index (FBI) is an indicator of organic and nutrient pollution and provides an estimate of water quality conditions for each site using established pollution tolerance values for benthic invertebrates. FBI results for Black Creek are separated by reporting period 2003 to 2008 and 2009 to 2014. “Poor” to “Fair” water quality conditions being observed at the Black Creek sample location for the period from 2003 to 2014 (Fig.25) using a grading scheme developed by Conservation Authorities in Ontario for benthic invertebrates. Family Richness measures the health of the community through its diversity and increases with increasing habitat diversity suitability and healthy water quality conditions. Family Richness is equivalent to the total number of benthic invertebrate families found within a sample. Black Creek is reported to have “Fair” to “Good” family richness (Fig.26). Ephemeroptera (Mayflies), Plecoptera (Stoneflies), and Trichoptera (Caddisflies) are species considered to be very sensitive to poor water quality conditions. High abundance of these organisms is generally an indication of good water quality conditions at a sample location. The community structure is dominated by species that are not sensitive to poor water quality conditions. As a result, the EPT indicates that Black Creek is reported to have “Poor” to “Fair” water quality (Fig.27) from 2003 to 2014. Overall Black Creek aquatic habitat conditions from a benthic invertebrate perspective range from “Poor” to "Fair" from 2003 to 2014. Streams are naturally meandering systems and move over time; there are varying degrees of habitat complexity, depending on the creek. Examples of habitat complexity include variable habitat types such as pools and riffles as well as substrate variability and woody debris structure. A high percentage of habitat complexity (heterogeneity) typically increases the biodiversity of aquatic organisms within a system. Fifty nine percent of Black Creek was considered heterogeneous, as shown in Figure 28. Diverse substrate is important for fish and benthic invertebrate habitat because some species have specific substrate requirements and for example will only reproduce on certain types of substrate. Figure 29 shows that 28 percent of the substrate observed on Black Creek was dominated by cobble. Overall substrate conditions were highly variable along Black Creek. Figure 30 shows the dominant substrate type observed for each section surveyed along Black Creek. Boulders create instream cover and back eddies for large fish to hide and/or rest out of the current. Cobble provides important spawning habitat for certain fish species like walleye and various shiner species who are an important food source for larger fish. Cobble can also provide habitat conditions for benthic invertebrates that are a key food source for many fish and wildlife species. Figure 31 shows where cobble and boulder substrate are found in Black Creek. Pools and riffles are important habitat features for fish. Riffles are areas of agitated water and they contribute higher dissolved oxygen to the stream and act as spawning substrate for some species of fish, such as walleye. Pools provide shelter for fish and can be refuge pools in the summer if water levels drop and water temperature in the creek increases. Pools also provide important over wintering areas for fish. Runs are usually moderately shallow, with unagitated surfaces of water and areas where the thalweg (deepest part of the channel) is in the center of the channel. Figure 32 shows that Black Creek is fairly uniform; 88 percent consists of runs, 7 percent riffles and 5 percent pools. Figure 33 shows where riffle habitat was observed along Black Creek. Instream vegetation provides a variety of functions and is a critical component of the aquatic ecosystem. For example emergent plants along the shoreline can provide shoreline protection from wave action and important rearing habitat for species of waterfowl. Submerged plants provide habitat for fish to find shelter from predator fish while they feed. Floating plants such as water lilies shade the water and can keep temperatures cool while reducing algae growth. The dominant vegetation type recorded at thirty percent consisted of submerged plants. Black Creek had high levels of diversity for instream vegetation. Figure 34 depicts the plant community structure for Black Creek. Figure 35 shows the dominant vegetation type observed for each section surveyed along Black Creek. Instream vegetation is an important factor for a healthy stream ecosystem. Vegetation helps to remove contaminants from the water, contributes oxygen to the stream, and provides habitat for fish and wildlife. Too much vegetation can also be detrimental. Figure 36 demonstrates that Black Creek had sections dominated by common and normal low levels of instream vegetation for fifty two percent of its length. Invasive species can have major implications on streams and species diversity. Invasive species are one of the largest threats to ecosystems throughout Ontario and can out compete native species, having negative effects on local wildlife, fish and plant populations. One hundred percent of the sections surveyed along Black Creek had invasive species (Figure 37). The invasive species observed in Black Creek were European frogbit, purple loosestrife, glossy and common buckthorn, banded mystery snail, curly leafed pondweed, flowering rush, bull thistle, honey suckle, wild parsnip and Manitoba maple. Figure 38 shows the frequency of the invasive species observed along Black Creek. During the stream characterization survey, a YSI probe is used to collect water chemistry information. Dissolved oxygen, conductivity and pH are measured at the start and end of each section. Dissolved oxygen is a measure of the amount of oxygen dissolved in water. The Canadian Environmental Quality Guidelines of the Canadian Council of Ministers of the Environment (CCME) suggest that for the protection of aquatic life the lowest acceptable dissolved oxygen concentration should be 6 mg/L for warmwater biota and 9.5 mg/L for coldwater biota (CCME, 1999). Figure 39 shows that the dissolved oxygen in Black Creek was within the threshold for warmwater biota in most reaches of the system, however areas in the headwaters were below the warmwater threshold. The average dissolved oxygen levels observed within the main stem of Black Creek was 6.02mg/L which is within the recommended levels for warmwater biota. Conductivity in streams is primarily influenced by the geology of the surrounding environment, but can vary drastically as a function of surface water runoff. Currently there are no CCME guideline standards for stream conductivity, however readings which are outside the normal range observed within the system are often an indication of unmitigated discharge and/or stormwater input. The average conductivity observed within the main stem of Black Creek was 328 µs/cm. Figure 40 shows that the conductivity readings for Black Creek. Based on the PWQO for pH, a range of 6.5 to 8.5 should be maintained for the protection of aquatic life. Average pH values for Black Creek averaged 7.5 thereby meeting the provincial standard (Figure 41). Many factors can influence fluctuations in stream temperature, including springs, tributaries, precipitation runoff, discharge pipes and stream shading from riparian vegetation. Water temperature is used along with the maximum air temperature (using the Stoneman and Jones method) to classify a watercourse as either warm water, cool water or cold water. Analysis of the data collected indicates that Black Creek is classified as a cool - warm water system with warm water reaches. Figure 42 shows the thermal sampling locations. Figure 43 Temperature logger data for two sites on Black Creek. Groundwater discharge areas can influence stream temperature, contribute nutrients, and provide important stream habitat for fish and other biota. During stream surveys, indicators of groundwater discharge are noted when observed. Indicators include: springs/seeps, watercress, iron staining, significant temperature change and rainbow mineral film. Figure 44 shows areas where one or more of the above groundwater indicators were observed during stream surveys and headwater assessments. The RVCA Stream Characterization program assessed Headwater Drainage Features for the Middle Rideau subwatershed in 2014. This protocol measures zero, first and second order headwater drainage features (HDF). It is a rapid assessment method characterizing the amount of water, sediment transport, and storage capacity within headwater drainage features (HDF). RVCA is working with other Conservation Authorities and the Ministry of Natural Resources and Forestry to implement the protocol with the goal of providing standard datasets to support science development and monitoring of headwater drainage features. An HDF is a depression in the land that conveys surface flow. Additionally, this module provides a means of characterizing the connectivity, form and unique features associated with each HDF (OSAP Protocol, 2013). In 2014 the program sampled 30 sites at road crossings in the Black Creek catchment area (Figure 45). The headwater sampling protocol assesses the feature type in order to understand the function of each feature. The evaluation includes the following classifications: defined natural channel, channelized or constrained, multi-thread, no defined feature, tiled, wetland, swale, roadside ditch and pond outlet. By assessing the values associated with the headwater drainage features in the catchment area we can understand the ecosystem services that they provide to the watershed in the form of hydrology, sediment transport, and aquatic and terrestrial functions. The Black Creek catchment is dominated by natural channel and wetland headwater drainage features. However, there were several features classified as channelized, while there were three features that ran along the road. Two features were classified as not having a defined channel. Figure 46 shows the feature type of the primary feature at the sampling locations. Channel modifications were assessed at each headwater drainage feature sampling location. Modifications include channelization, dredging, hardening and realignments. The sampling locations for the Black Creek catchment were classified with a variety of channel modifications. Many of the features had no channel modifications, however several were classified as having mixed modifications or had been recently dredged/cleaned out. Figure 47 shows the channel modifications observed at the sampling locations for Black Creek. Headwater feature vegetation evaluates the type of vegetation that is found within the drainage feature. The type of vegetated within the channel influences the aquatic and terrestrial ecosystem values that the feature provides. For some types of headwater features the vegetation within the feature plays a very important role in flow and sediment movement and provides wildlife habitat. The following classifications are evaluated no vegetation, lawn, wetland, meadow, scrubland and forest. Figure 48 depicts the dominant vegetation observed at the sampled headwater sites in the Black Creek catchment. Headwater riparian vegetation evaluates the type of vegetation that is found along the adjacent lands of a headwater drainage feature. The type of vegetation within the riparian corridor influences the aquatic and terrestrial ecosystem values that the feature provides to the watershed. The majority of the sample locations in Black Creek were dominated by natural vegetation in the form of scrubland, forest and wetland vegetation. Figure 49 depicts the type of riparian vegetation observed at the sampled headwater sites in the Black Creek catchment. Assessing the amount of recent sediment deposited in a channel provides an index of the degree to which the feature could be transporting sediment to downstream reaches (OSAP, 2013). Evidence of excessive sediment deposition might indicate the requirement to follow up with more detailed targeted assessments upstream of the site location to identify potential best management practices to be implemented. Conditions ranged from no deposition observed to a site with substantial deposition recorded. Overall most sites had minimal to moderate levels of sediment deposition. Figure 50 depicts the degree of sediment deposition observed at the sampled headwater sites in the Black Creek catchment. Feature roughness will provide a measure of the amount of materials within the bankfull channel that could slow down the velocity of water flowing within the headwater feature (OSAP, 2013). Materials on the channel bottom that provide roughness include vegetation, woody debris and boulders/cobble substrates. Roughness can provide benefits in mitigating downstream erosion on the headwater drainage feature and the receiving watercourse by reducing velocities. Roughness also provides important habitat conditions to aquatic organisms. Many of the sample locations in the Black Creek catchment area had extreme to moderate levels of feature roughness. Figure 51 shows the feature roughness conditions at the sampling locations in the Black Creek catchment. The Black Creek catchment is classified as a mixed community of warm and cool water recreational and baitfish fishery with 26 species observed. Table 11 lists the species observed in the catchment (Source: MNR/RVCA). Figure 52 shows the fish sampling locations for Black Creek. It is important to know locations of migratory obstructions because these can prevent fish from accessing important spawning and rearing habitat. Migratory obstructions can be natural or manmade, and they can be permanent or seasonal. Figure 53 shows that the headwaters and the main stem of Black Creek had a beaver dam, perched culvert and a grade barrier at the time of the survey in 2014. Figure 54 depicts the locations where various riparian restoration activities can be implemented as a result of observations made during the stream survey and headwater drainage feature assessments. The surveys identified one riparian planting opportunity on a headwater feature. Land cover and any change in coverage that has occurred over a six year period is summarized for the Black Creek catchment using spatially continuous vector data representing the catchment during the spring of 2008 and 2014. This dataset was developed by the RVCA through heads-up digitization of 20cm DRAPE ortho-imagery at a 1:4000 scale and details the surrounding landscape using 10 land cover classes. As shown in Table 12, the dominant land cover types in the catchment through 2008 and 2014 were crop and pastureland and wetland followed by woodland. From 2008 to 2014, there was an overall change of 190 hectares (from one land cover class to another). Change within the Black Creek catchment is primarily associated with ‘crop and pasture’ being converted to ‘settlement’ and ‘woodland’ to ‘settlement’. These areas are largely associated with newly constructed solar farms which are identified as the four large pink polygons in Figure 55. Table 13 shows the type of land cover change that has taken place between land cover classes/types from 2008 to 2014. Overall, the net area of crop and pasture change (loss) is relatively small at 140 hectares relative to the remaining area of crop and pasture in the catchment (as of 2014). Similarly, the net area of woodland change (loss) is very small at 29 hectares relative to the remaining area of woodland in the catchment (as of 2014). In the Environment Canada Guideline (Third Edition) entitled “How Much Habitat Is Enough?” (hereafter referred to as the “Guideline”) the opening narrative under the Forest Habitat Guidelines section states that prior to European settlement, forest was the predominant habitat in the Mixedwood Plains ecozone. The remnants of this once vast forest now exist in a fragmented state in many areas (including the Rideau Valley watershed) with woodland patches of various sizes distributed across the settled landscape along with higher levels of forest cover associated with features such as the Frontenac Axis (within the on-Shield areas of the Rideau Lakes and Tay River subwatersheds). The forest legacy, in terms of the many types of wildlife species found, overall species richness, ecological functions provided and ecosystem complexity is still evident in the patches and regional forest matrices (found in the Middle Rideau subwatershed and elsewhere in the Rideau Valley watershed). These ecological features are in addition to other influences which forests have on water quality and stream hydrology including reducing soil erosion, producing oxygen, storing carbon along with many other ecological services that are essential not only for wildlife but for human well-being. The Guideline also notes that forests provide a great many habitat niches that are in turn occupied by a great diversity of plant and animal species. They provide food, water and shelter for these species - whether they are breeding and resident locally or using forest cover to help them move across the landscape. This diversity of species includes many that are considered to be species at risk. Furthermore, from a wildlife perspective, there is increasing evidence that the total forest cover in a given area is a major predictor of the persistence and size of bird populations, and it is possible or perhaps likely that this pattern extends to other flora and fauna groups. The overall effect of a decrease in forest cover on birds in fragmented landscapes is that certain species disappear and many of the remaining ones become rare, or fail to reproduce, while species adapted to more open and successional habitats, as well as those that are more tolerant to human-induced disturbances in general, are able to persist and in some cases thrive. Species with specialized-habitat requirements are most likely to be adversely affected. The overall pattern of distribution of forest cover, the shape, area and juxtaposition of remaining forest patches and the quality of forest cover also play major roles in determining how valuable forests will be to wildlife and people alike. The current science generally supports minimum forest habitat requirements between 30 and 50 percent, with some limited evidence that the upper limit may be even higher, depending on the organism/species phenomenon under investigation or land-use/resource management planning regime being considered/used. As shown in Figure 56, 29 percent of the Black Creek catchment contains 2924 hectares of upland forest and 886 hectares of lowland forest (treed swamps) versus the 34 percent of woodland cover in the Middle Rideau subwatershed. This is less than the 30 percent of forest cover that is identified as the minimum threshold required to sustain forest birds according to the Guideline and which may only support less than one half of potential species richness and marginally healthy aquatic systems. When forest cover drops below 30 percent, forest birds tend to disappear as breeders across the landscape. According to the Ministry of Natural Resources’ Natural Heritage Reference Manual (Second Edition), larger woodlands are more likely to contain a greater diversity of plant and animal species and communities than smaller woodlands and have a greater relative importance for mobile animal species such as forest birds. Bigger forests often provide a different type of habitat. Many forest birds breed far more successfully in larger forests than they do in smaller woodlots and some rely heavily on forest interior conditions. Populations are often healthier in regions with more forest cover and where forest fragments are grouped closely together or connected by corridors of natural habitat. Small forests support small numbers of wildlife. Some species are “area-sensitive” and tend not to inhabit small woodlands, regardless of forest interior conditions. Fragmented habitat also isolates local populations, especially small mammals, amphibians and reptiles with limited mobility. This reduces the healthy mixing of genetic traits that helps populations survive over the long run (Conserving the Forest Interior. Ontario Extension Notes, 2000). The Environment Canada Guideline also notes that for forest plants that do not disperse broadly or quickly, preservation of some relatively undisturbed large forest patches is needed to sustain them because of their restricted dispersal abilities and specialized habitat requirements and to ensure continued seed or propagation sources for restored or regenerating areas nearby. The Natural Heritage Reference Manual continues by stating that a larger size also allows woodlands to support more resilient nutrient cycles and food webs and to be big enough to permit different and important successional stages to co-exist. Small, isolated woodlands are more susceptible to the effects of blowdown, drought, disease, insect infestations, and invasions by predators and non-indigenous plants. It is also known that the viability of woodland wildlife depends not only on the characteristics of the woodland in which they reside, but also on the characteristics of the surrounding landscape where the woodland is situated. Additionally, the percentage of forest cover in the surrounding landscape, the presence of ecological barriers such as roads, the ability of various species to cross the matrix surrounding the woodland and the proximity of adjacent habitats interact with woodland size in influencing the species assemblage within a woodland. In the Black Creek catchment (in 2014), 152 (37 percent) of the 410 woodland patches are very small, being less than one hectare in size. Another 209 (51 percent) of the woodland patches ranging from one to less than 20 hectares in size tend to be dominated by edge-tolerant bird species. The remaining 49 (12 percent of) woodland patches range between 21 and 271 hectares in size. Forty-four of these patches contain woodland between 20 and 100 hectares and may support a few area-sensitive species and some edge intolerant species, but will be dominated by edge tolerant species. Conversely, five (one percent) of the 410 woodland patches in the drainage area exceed the 100 plus hectare size needed to support most forest dependent, area sensitive birds and are large enough to support approximately 60 percent of edge-intolerant species. One patch tops 200 hectares, which according to the Environment Canada Guideline will support 80 percent of edge-intolerant forest bird species (including most area sensitive species) that prefer interior forest habitat conditions. Table 14 presents a comparison of woodland patch size in 2008 and 2014 along with any changes that have occurred over that time. A decrease (of 2 ha) has been observed in the overall woodland patch area between the two reporting periods with most change occurring in the 50 to 100 and 100 to 200 hectare woodland patch size class ranges. The forest interior is habitat deep within woodlands. It is a sheltered, secluded environment away from the influence of forest edges and open habitats. Some people call it the “core” or the “heart” of a woodland. The presence of forest interior is a good sign of woodland health, and is directly related to the woodland’s size and shape. Large woodlands with round or square outlines have the greatest amount of forest interior. Small, narrow woodlands may have no forest interior conditions at all. Forest interior habitat is a remnant natural environment, reminiscent of the extensive, continuous forests of the past. This increasingly rare forest habitat is now a refuge for certain forest-dependent wildlife; they simply must have it to survive and thrive in a fragmented forest landscape (Conserving the Forest Interior. Ontario Extension Notes, 2000). The Natural Heritage Reference Manual states that woodland interior habitat is usually defined as habitat more than 100 metres from the edge of the woodland and provides for relative seclusion from outside influences along with a moister, more sheltered and productive forest habitat for certain area sensitive species. Woodlands with interior habitat have centres that are more clearly buffered against the edge effects of agricultural activities or more harmful urban activities than those without. In the Black Creek catchment (in 2014), the 410 woodland patches contain 136 forest interior patches (Figure 56) that occupy three percent (423 ha.) of the catchment land area (which is less than the five percent of interior forest in the Middle Rideau Subwatershed). This is below the ten percent figure referred to in the Environment Canada Guideline that is considered to be the minimum threshold for supporting edge intolerant bird species and other forest dwelling species in the landscape. Most patches (122) have less than 10 hectares of interior forest, 82 of which have small areas of interior forest habitat less than one hectare in size. The remaining 14 patches contain interior forest ranging between 10 and 38 hectares in area. Between 2008 and 2014, there has been a notable change in the number of woodland patches containing smaller areas of interior habitat (Table 15) with an increase of 56 woodlands containing less than one hectare of interior forest over this period and 10 woodlands with one to 10 hectares of interior habitat. This appears to have occurred as a result of the loss of interior forest habitat in the largest woodland patch in the catchment over this period. Wetlands are habitats forming the interface between aquatic and terrestrial systems. They are among the most productive and biologically diverse habitats on the planet. By the 1980s, according to the Natural Heritage Reference Manual, 68 percent of the original wetlands south of the Precambrian Shield in Ontario had been lost through encroachment, land clearance, drainage and filling. Historically, the overall wetland coverage within the Great Lakes basin exceeded 10 percent, but there was significant variability among watersheds and jurisdictions, as stated in the Environment Canada Guideline. In the Rideau Valley Watershed, it has been estimated that pre-settlement wetland cover averaged 35 percent using information provided by Ducks Unlimited Canada (2010) versus the 21 percent of wetland cover existing in 2014 derived from DRAPE imagery analysis. Using the same dataset, it is estimated that pre-settlement (historic) wetland cover averaged 32 percent in the Middle Rideau subwatershed versus the 27 percent of cover existing in 2014. This decline in wetland cover is also evident in the Black Creek catchment (as seen in Figure 57) where there has been a 16 percent decrease in the area of wetland cover from pre-settlement times to the present (as summarized in Table 16). While there has been a reported decrease in wetland cover in the Barbers Creek catchment from pre-settlement times, the remaining wetland cover in 2014 remains above the ecological thresholds cited in the Environment Canada Guideline. Nonetheless, in order to maintain critical hydrological, ecological functions along with related recreational and economic benefits provided by these wetland habitats in the catchment, a “no net loss” of currently existing wetlands should be employed to ensure the continued provision of tangible benefits accruing from them for landowners and surrounding communities. The RVCA and its partners are working to protect and enhance environmental conditions in the Middle Rideau Subwatershed. Figure 58 shows the location of all stewardship projects completed in the Black Creek catchment along with sites identified for potential shoreline restoration. From 2009 to 2014, two well upgrades, one septic system replacement and one wastewater runoff project were completed. Between 2003 and 2008, six well upgrades, three well decommissionings, one well replacement and one fuel storage and handling facility were completed. Prior to 2003, one livestock fencing project and one manure storage facility were completed. Total value of all 17 projects is $69,105 with $42,133 of that amount funded through grant dollars from the RVCA. 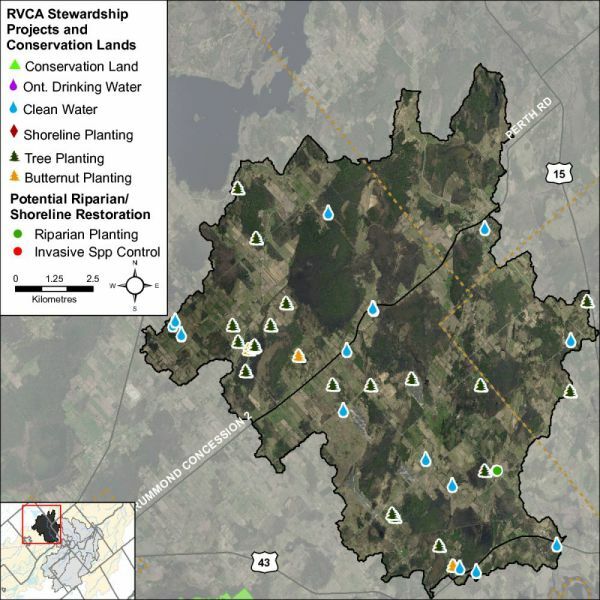 The location of RVCA Tree Planting Program projects is shown in Figure 58. From 2009 to 2014, 41.880 trees were planted at five sites. Between 2003 and 2008, 13,170 trees were planted at five sites and prior to 2003, 49,810 trees were planted at ten sites, resulting in the reforestation of 56 hectares. Total value of all 20 projects is $299,751 with $80,886 of that amount coming from various fundraising sources. Through the RVCA Butternut Recovery Program, an additional 60 butternut trees were planted in the Black Creek catchment between 2003 and 2008, as part of efforts to introduce healthy seedlings from tolerant butternuts into various locations across Eastern Ontario. The Black Creek catchment covers 131 square kilometres with 30 square kilometres (or 23 percent) of the drainage area being within the regulation limit of Ontario Regulation 174/06 (Figure 59), giving protection to wetland areas and river or stream valleys that are affected by flooding and erosion hazards. 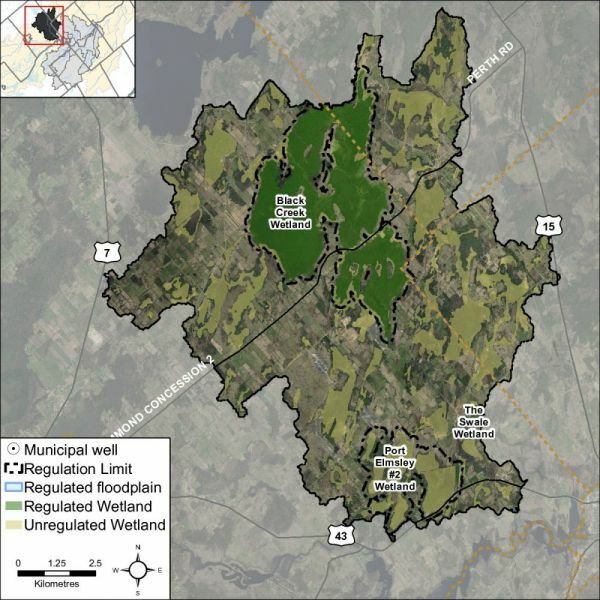 Wetlands occupy 46.5 sq. km. (or 36 percent) of the catchment. Of these wetlands, 17.4 sq. km (or 37 percent) are designated as provincially significant and included within the RVCA regulation limit. This leaves the remaining 29.1 sq. km (or 63 percent) of wetlands in the catchment outside the regulated area limit. Of the 190.1 kilometres of stream in the catchment, regulation limit mapping has been plotted along 50 kilometers of streams (representing 26 percent of all streams in the catchment). Some of these regulated watercourses (32.7 km or 17 percent of all streams) flow through regulated wetlands; the remaining 17.3 km (or 35 percent) of regulated streams are located outside of those wetlands. Plotting of the regulation limit on the remaining 140.1 km (or 74 percent) of streams requires identification of flood and erosion hazards and valley systems. Within the regulation limit, “development” and “site alteration” require RVCA permission. The “alteration to waterways” provision of Ontario Regulation 174/06 applies to all watercourses. The Black Creek drainage catchment is considered to have a Highly Vulnerable Aquifer. This means that the nature of the overburden (thin soils, fractured bedrock) does not provide a high level of protection for the underlying groundwater making the aquifer more vulnerable to contaminants released on the surface. The Mississippi-Rideau Source Protection Plan includes policies that focus on the protection of groundwater region-wide due to the fact that most of the region, which encompasses the Mississippi and Rideau watersheds, is considered Highly Vulnerable Aquifer. The area around the headwaters of Black Creek is also considered a Significant Groundwater Recharge Area. This means that there is a volume of water moving from the surface into the ground and groundwater serves either as a municipal drinking water source or supplies a stream ecosystem. The Plan was not required to include policies to specifically address Significant Groundwater Recharge Areas. For detailed maps and policies that have been developed to protect drinking water sources, please go to the Mississippi-Rideau Source Protection Region website at www.mrsourcewater.ca to view the Mississippi-Rideau Source Protection Plan.